Today’s photo highlights a 3D bucket elevator. 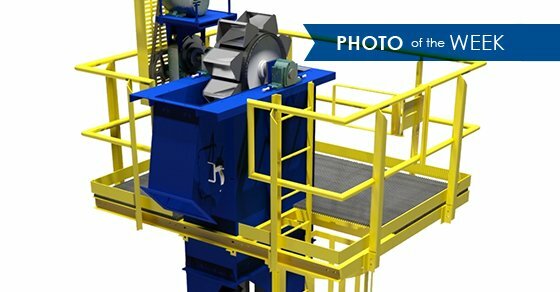 FEECO offers both continuous and centrifugal bucket elevators, all designed and manufactured to meet the needs of the unique material to be transported. Continuous bucket elevators are predominantly used when gentle material transportation is required, such as with fragile and light materials, or materials prone to aeration. How do they work? Material is fed into the buckets from an inlet chute. The material then pours out of the bucket, gently, sliding down the inverted bucket ahead into the discharge chute. Centrifugal bucket elevators are primarily selected when large amounts of material need to be transported speedily. They are ideal for durable and abrasive materials, such as woodchips, gravel or sand. How do they work? Buckets serve as the loading device by scooping material up from the boot or inlet section. Force from the head pulley then lodges material from the buckets and into the discharge chute. Chains or belts are both offered with continuous and centrifugal elevator types. Various bucket styles are also offered to meet the demands of different applications and materials. FEECO’s experience in bucket elevator design and manufacturing dates back to 1951. For over 65 years, we’ve served a broad range of customers with the best in bucket elevator manufacturing. Contact us today for more information.